On July 10, 15 students from Virginia Tech and Denver University (DU) arrived in Lilongwe, Malawi, to join students from Mzuzu University (Mzuni) for a joint WASH (Water, Sanitation, and Hygiene) course. I am currently teaching this course with Dr. Rochelle Holm (Mzuni), Dr. Mavuto Tembo (Mzuni), and Dr. Emily Van Houweling (DU). For the first two days of the course we held meetings with key officials in the capital, Lilongwe, beginning with U.S. Ambassador Palmer who described the strong U.S.-Malawi relationship. Ambassador Palmer outlined the various programs the U.S. government supports to spur economic development and help the 6.5 million Malawians at risk from flooding and drought. She also emphasized the unique opportunities that exist for U.S. companies to invest in Malawi. It was interesting to learn that Malawi (one of the poorest countries in the world) is one of a few countries that receives support from all the main U.S. foreign assistance programs. 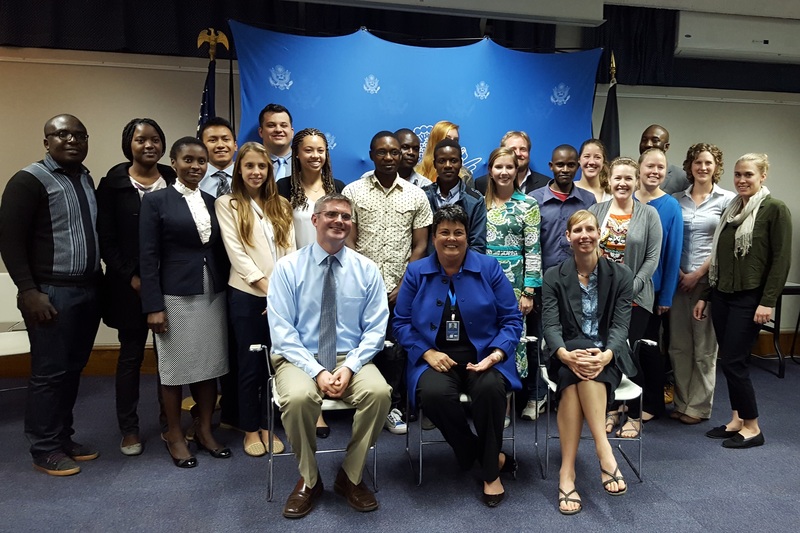 Following our meeting with the Ambassador, students had the opportunity to meet with Edward Monster, the Public Affairs Officer for the U.S. Embassy in Malawi and Carol Spahn, the Country Director for Peace Corps Malawi (below). 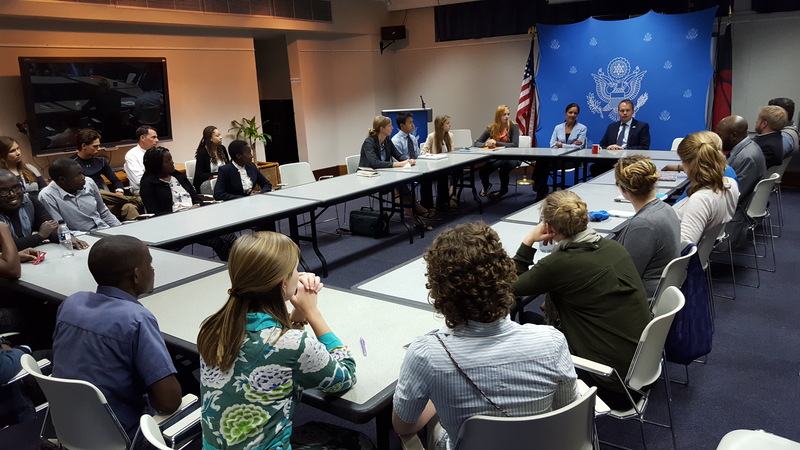 During this conversation, students were able to learn about foreign service from the perspective of the U.S. Department of State and Peace Corps. It was interesting to hear that students can now select which country they would like to serve in for Peace Corps. 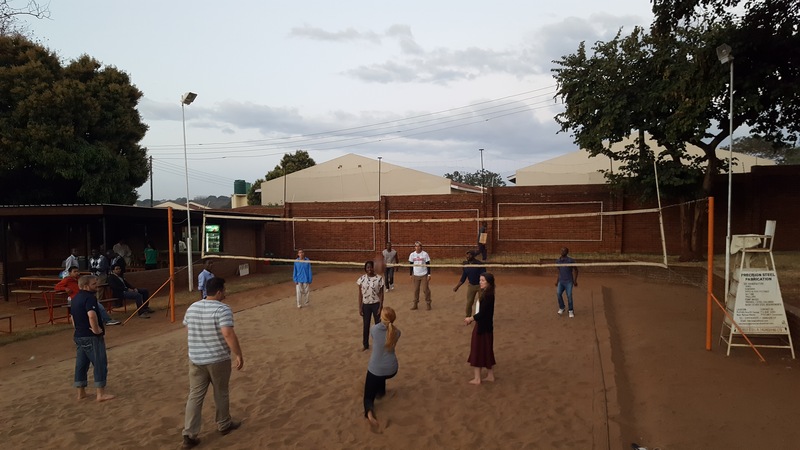 In the afternoon and evening on the first day, we held some get-to-know-you activities and relaxed a little with some games of volleyball at a local facility. The following day, students had the opportunity to speak with Asayire Kapira (WES Network), Thanasius Sitolo (the Department of Water Supply and Sanitation), and Lucy Mungoni (USAID Malawi) about the WASH situation and WASH actors in Malawi. Following these meetings, the group left Lilongwe for a five hour drive to Mzuzu where we will hold the rest of the course.